The difference we bring is the approach based on music theory, chord and chroma distances. 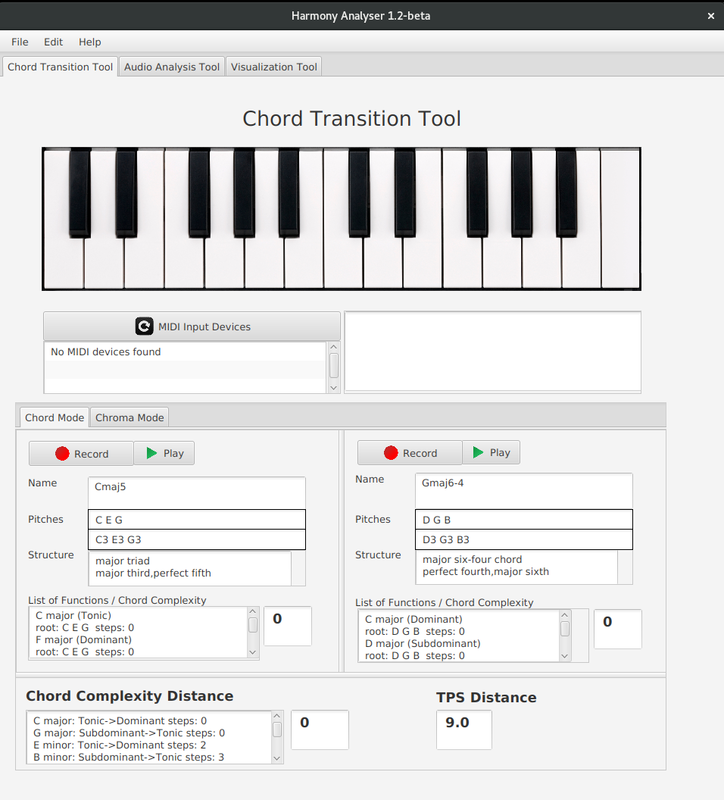 JHarmonyAnalyser uses recent music theory models to extract musical meaning and distances between chords and chroma vectors. We aim to develop open-source music player, which is musician / musicologist-friendly and aid recent music information retrieval tasks. 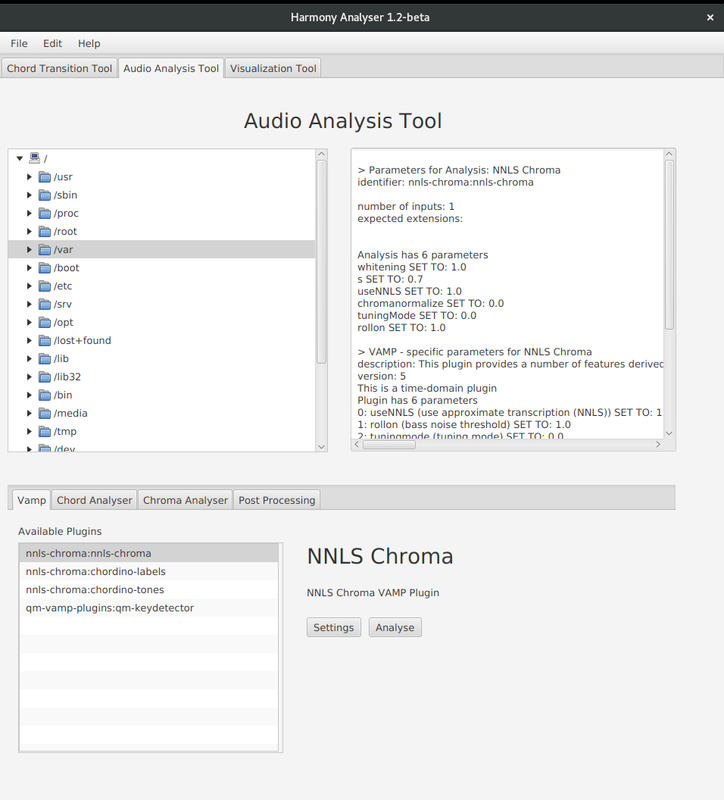 harmony-analyser tools and JHarmonyAnalyser library are licenced under the GNU GPL License. 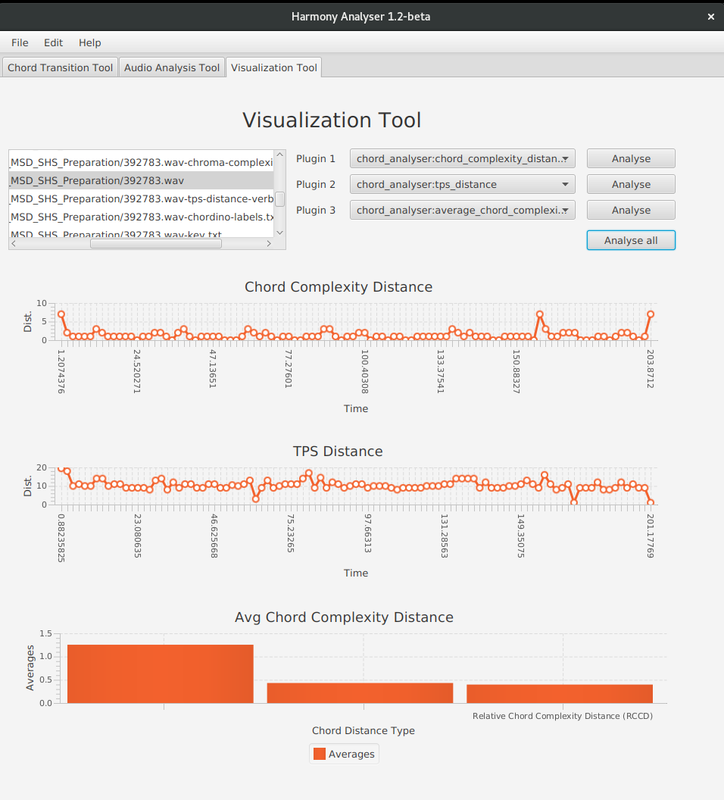 Tools are compatible with GPL Licensed Vamp plugins which can be used for additional analysis. To contribute, please follow our guideline in GitHub repository. 2018-12-10 A new journal article has just been published in the Volume 12/4 (December) of the International Journal of Semantic Computing! Its main contribution is the Cover Song Identification on our Kara1k dataset within the KaraMIR project of three universities. Our last year's IEEE Best Paper nominee was selected to form the basis of this extended article. 2018-01-19 Kara1k dataset publication is now available in IEEE Xplore library. 2017-12-19 Kara1k dataset with our harmony-analyser features is now fully available! Our work was awarded a Honorable Mention by the chairs for 6 best papers on IEEE ISM 2017 in Taichung, Taiwan. Please see the conference poster and presentation to get a grasp on how to utilize these features and dataset for your own research. 2017-10-01 harmony-analyser was used to extract features for the new Kara1k dataset along other feature extraction tools such as Marsyas, YAAFE or Essentia. The dataset and results will be presented on IEEE ISM 2017 conference in Taichung, Taiwan. This dataset was built thanks to a partnership with Recisio's KaraFun karaoke application. 2017-06-13 We travel to Poland to present first results of our harmony analysis on Cover Song Identification task, as a part of CISIM 2017 conference. Paper published in Springer LNCS series. 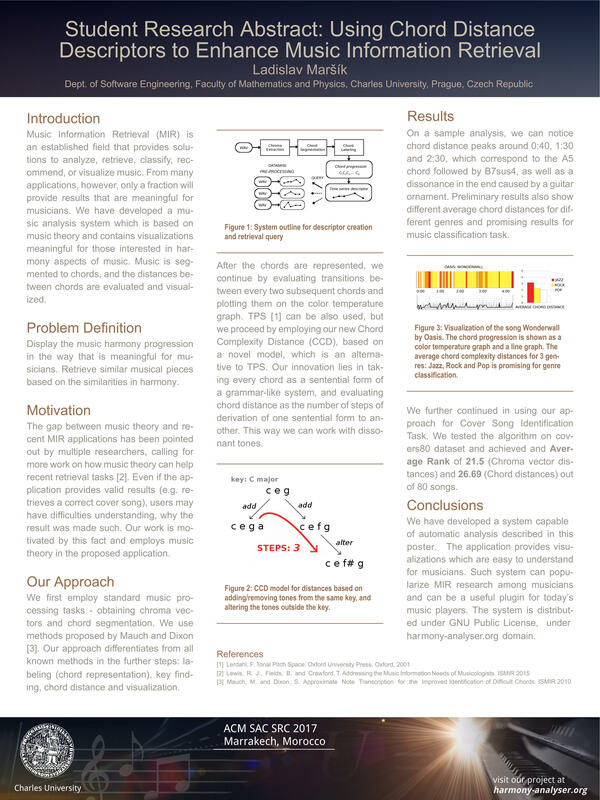 2017-05-09 A little article by the Charles University (in Czech language) written about the recent ACM SRC competition, where the harmony-analyser project was presented by Ladislav Marsik. 2017-04-21 Our contribution was awarded a 1st place in ACM SIGAPP SAC 2017 Student Research Competition! We presented a poster, oral presentation and a live demo of our tools to the SRC judges. We advanced to the ACM SRC Grand Finale for all the SRC Winners. Research abstract soon to appear in the ACM Digital Library. 2017-04-11 We presented how to use our tools on DATESO 2017 conference. Paper or presentation for download. 2016-12-16 We were on 2016 Joint WOCMAT - IRCAM Forum Conference in Taiwan! Check out the contribution paper or presentation. 2016-12-07 Preparing the new GUI for version 1.2 - see sneak peak in the screenshots. 2016-09-19 Version 1.1 is now available (new Chroma distances and visualizations). This software has been funded by the Charles University, projects GA UK No. 708314, GA UK No. 1580317, SVV-2014-260100, SVV-2016-260331 and SVV 260451.